According to the 2015 Dietary Guidelines for Americans, we’re consistently falling short on our intake of vitamin D, calcium, and potassium. Nutrition research shows the easiest way to add the health benefits of dairy to your diet is to enjoy three servings of dairy foods daily. A commonly cited reason for hesitation when it comes to dairy foods is lactose intolerance. People who are sensitive to lactose often avoid milk and assume all foods made from milk contain equal amounts of lactose. This is where yogurt saves the day. Here are the top five reasons why you should eat more yogurt, whether you are sensitive to lactose or not. The production of yogurt and its pourable cousin kefir involves the fermentation of milk using healthy bacteria. These bacteria break down the naturally-occurring sugars in milk (lactose), making yogurt more digestible for lactose-intolerant individuals. Both yogurt and kefir are rich in what are known as probiotics which are the friendly bacteria that promote good digestion and boosts the immune system, fight infections, and counters harmful bacteria in our stomach and intestines that may make us sick. Think of your intestines as a large parking lot. The more spaces filled with good bacteria, the less room for bad bacteria. Many in our country suffer compromised bone health due to inadequate intake of bone-building calcium. Research indicates that probiotic-rich foods like yogurt enhance absorption of calcium and other minerals. Calcium supplements are a common culprit in the formation of kidney stones, yet many women use supplements to meet their calcium needs. The calcium found in dairy foods like yogurt has been identified as a protective factor against the formation of kidney stones. While other types of food with probiotic value do exist, dairy products such as yogurt and kefir are the main sources of probiotics in the American diet, with yogurt being the most popular. Yogurt is readily accessible, inexpensive, acceptable across cultures and religions, and versatile to suit most taste palates. Yogurt is also a great alternative for children who don’t like milk. Flavored yogurt can be a sweet treat for all ages that provides high-quality protein and necessary vitamins and minerals. 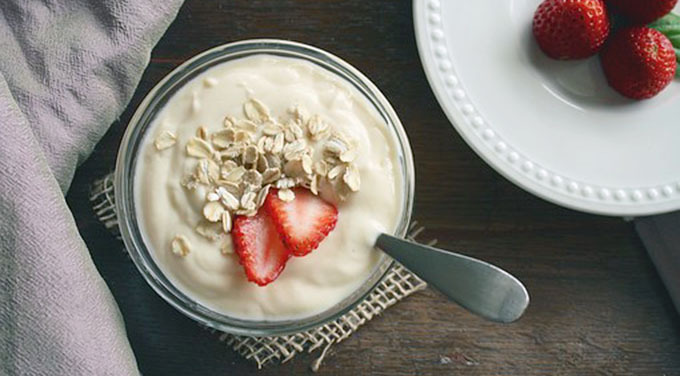 So how do you get more yogurt (or kefir) into your daily diet to promote optimal health? The simplest way is to build your bowl backwards, whether be it a bowl of cold cereal, hot cereal, or yogurt. Start with heart-healthy nuts that fill the cupped palm of your hand, then add a plentiful amount of fiber-rich fruit like berries. Add yogurt or kefir and top with a small quantity of raw oats, cooked oats or cold cereal of your choice. This combination will leave you feeling full and satisfied with the vitamin D, calcium, and potassium that is too often lacking in our diets. Use yogurt in place of sour cream in recipes and when serving meals. Make overnight oats for a quick breakfast on the go. Top whole-grain frozen waffles with a dollop of yogurt, fresh berries and a drizzle of honey. Snack on flavorful yogurt dip with crisp veggies and whole grain crackers.